Moments before the Washington Redskins were on the clock with the No. 5 selection in the NFL draft last year, Neil Cornrich asked Brandon Scherff where his cell phone was. It was in Scherff’s pocket, and the hulking offensive tackle from Iowa would be better served if he had it ready, Cornrich told him. Through his wealth of experience as an agent, Cornrich had familiarized himself with Scot McCloughan’s draft history during various roles with the Green Bay Packers, San Francisco 49ers and Seattle Seahawks. He was enamored by two selections in particular: Running back Frank Gore in the third round in 2005 and inside linebacker Patrick Willis 11th overall in 2007, both drafted during McCloughan’s tenure with the 49ers. McCloughan selected the 6-foot-5, 320-pound offensive lineman with his first pick as the Redskins‘ general manager. It was a widely criticized pick, most notably because USC defensive end Leonard Williams was expected to be selected. McCloughan hardly cared. He had a vision of a very specific culture — one that emphasizes character just as much, if not more, than talent — that he is trying to shape in the Redskins' organization. Scherff epitomized it. This was the player who, in his senior season at Iowa, tore the meniscus in his right knee in a game against Ball State, had the knee scoped the following Tuesday, missed one practice and returned the next weekend to face Iowa State. 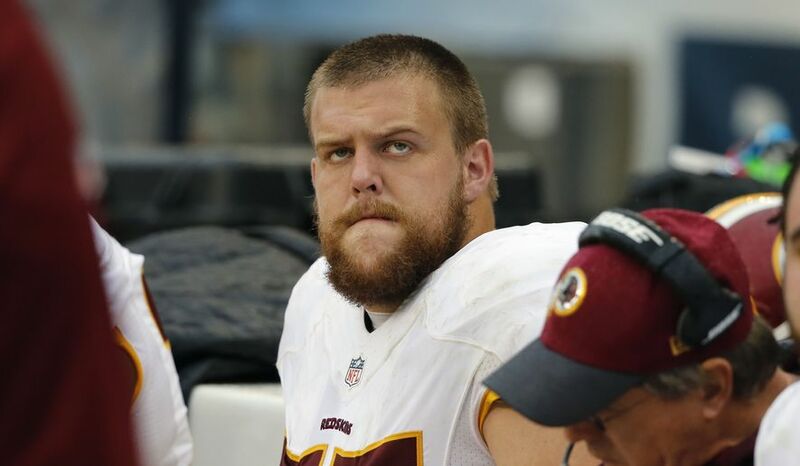 During the combine, Scherff dazzled the Redskins and numerous other teams in interviews not only with his football IQ, but his fierce loyalty to his family and teammates as well as an undeniable work ethic. “There were more talented guys than Brandon was at that pick,” McCloughan said. “I took him more as an entire football player than the talent level itself. I wanted the people to understand this is the way I see football. Big guys. Smart guys. Tough guys. Passionate guys. Competitive guys. That it’s about the team and not the individual. On Thursday, McCloughan will embark on his second draft as the Redskins‘ general manager, this time with the No. 21 pick, and he’ll do so by trusting a philosophy that’s been carefully crafted since he became an area scout for the Packers in 1994. Over the years, McCloughan, by his own admission, has had his share of draft failures, whether it was when he was vice president of player personnel and general manager of the 49ers, or the director of college scouting with the Seahawks from 2000 through 2004, and then a senior executive from 2010 until he resigned in 2014. Almost always, McCloughan said, he was burned when he sacrificed character for exceptional talent, a devilish temptation in a league where production equates with job security. That philosophy paid huge dividends in 2015 as five of the 10 players McCloughan drafted made a noticeable impact during the Redskins‘ improved season. Scherff, who became the starting right guard, played all but one snap as the starter and it was because his cleat fell off in a Week 5 game against the Atlanta Falcons. Outside linebacker Preston Smith, selected in the second round, had a slow start but finished the season with eight sacks, the most of any rookie. Third-round pick Matt Jones split carries with Alfred Morris and is in line to be the lead running back this season. Jamison Crowder, taken in the fourth round in large part because of his punt return skills, supplanted veteran Andre Roberts as the team’s slot wide receiver and caught 59 passes for 604 yards and two touchdowns. Kyshoen Jarrett emerged as a versatile defensive back and played 57 percent of defensive snaps before sustaining a nerve injury in the final game of the regular season. It didn’t take long for Scherff to notice the type of players McCloughan was invested in, and it showed early on. There is a term McCloughan favors when describing an ideal candidate for his team. He loves “football players,” though he doesn’t mean it in the literal sense. Iowa coach Kirk Ferentz, who has a strong relationship with McCloughan and shares a similar philosophy, can elaborate. When comparing Scherff to five-time Pro Bowler Marshal Yanda, the Baltimore Ravens’ right guard and former Iowa standout, Ferentz used the same term. Those are the character traits that McCloughan covets, and when he feels as if he’s found a player that exhibits them, it’s hard for him to pass them up. That’s why McCloughan was adamant about drafting Scherff with the fifth overall pick. Draft analysts projected Scherff would transition from left tackle to guard in the NFL, another reason the pick was criticized. A pick that high, most argued, was reserved for franchise-cornerstone left tackles. Again, McCloughan didn’t care. The character superseded the fit, and he trusted his gut based off previous experiences. Asked whether Scherff has that same makeup, McCloughan answered with a resounding yes. When McCloughan made his first draft selection as the Redskins‘ general manager, he had the opportunity to make it well-known what type of player he was hoping to build around. He got more than one in 2015, and the challenge now is to continue finding those type of players. That’s what McCloughan and his staff will set out to do this weekend. “It’s about the entire package, where I think hopefully it works out the same way here because that’s how we start building,” McCloughan said.